Spread out six of the slices of bread. Spread each of them with goat cheese. Place five of the cucumber slices on each of the six slices of bread in a single layer. 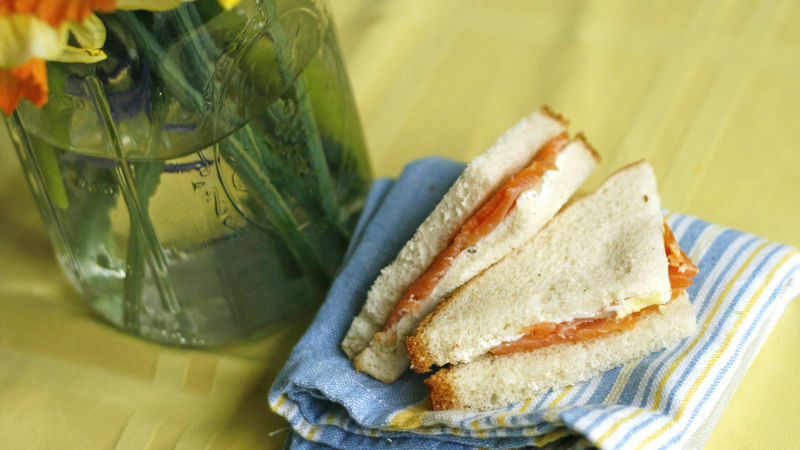 Divide the smoked salmon evenly among the six slices of bread. Top each with the remaining bread. Cut the sandwiches on the diagonals, creating four triangles per sandwich. Tea sandwich, anyone? Tea sandwiches are small sandwiches – just a couple bites big – filled with a variety of fillings. My favorite tea sandwich is Smoked Salmon and Cucumber Tea Sandwiches. They are little triangles filled with creamy goat cheese, crisp cucumbers and salty smoked salmon. It’s a trifecta of goodness stuffed between two firm slices of bread. But this isn’t the only filling for tea sandwiches. Tea sandwiches can be filled with everything from pesto, mozzarella and tomato to tuna salad to cream cheese and jelly. Get creative with yours, and your guests are sure to delight. Always choose a firm bread that can cut well and stand up the fillings. There is a bread labeled “sandwich bread” that works perfectly. To Cut the Crusts or Not to Cut the Crusts? As you can see, I don’t remove the crusts from my tea sandwiches. Honestly, the effort it would take to slice the crusts away isn’t worth it when they are only different in color than the bread. But some people do choose to remove from to give the sandwiches a uniform appearance. Really. It’s all up to you.